This week’s question comes from Lynette, who showed us how she was able to “catch” her fingernail on the side of a tooth in a groove that had been present for several years. Notches at the gumline generally occur on the outside (facial) surfaces of teeth. We all have a thick layer of natural ceramic-like coating on our teeth called enamel. This enamel forms a shell that protects the inner layers of the teeth from damage, but it thins out at it reaches the gumline. 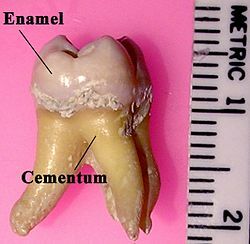 At this thin edge is a line called the cementoenamel junction. That’s where the crown of the tooth ends and the root begins. If a tooth has not had any damage, it is rare to be able to feel this line that is present all the way around the tooth because it is designed to be just under the surface of the gumline. Over time, though, many factors can cause gums to recede and expose the root. The most common cause of gum recession and notching is tooth stress that may be caused by a poor bite, clenching, or grinding. Excessive toothbrushing, acid erosion, and even tooth decay can also make the notches more prominent. Because roots are seven times softer than enamel, an “undercut” can form. This is what you may notice as a groove. Teeth that have notches at the gumline can be painful to cold, sweets, and even fingernails(! ), so a sensitive formula toothpaste is often recommended because it has smaller silica grit particles as well as a medicine designed to settle the nerves down. If a notch is so deep that there is a concern for tooth breakage or a cavity, Dr. Rossen will recommend to you that it be filled with a tooth-colored material for strength as well as for a better cosmetic appearance. To prevent the notches from getting worse, avoid using abrasive toothpaste and hard toothbrushes, keep the gumline areas clean, and wear a nightguard to ease clenching and grinding pressure. Additionally, we will help you monitor any progression with the digital images we periodically take of your mouth so that you can be assured that your teeth are healthy and stable. at what point would you consider an advanced form of treatment to fix the notches? such as VIP tunneling? While showing his old army dog tags to my daughter, my father asked if we knew what the notch in the dog tag was for. He told us that when a soldier died in combat, the notch was used to hold his jaw open at his teeth. Another soldier would then kick his jaw shut, imbedding the dog tag permanently in his upper teeth and jaw. The notch on the tag was introduced to easily locate the tag in a machine, with the right orientation and side ready for embossing data. The in the teeth myth is a wind-up. There are two tags so one can stay with the owner and the other collected to record the deceased. I felt something like the hull of popcorn on my tooth, so I started feeling around with my tongue. Suddenly I felt a piece of my tooth fall off onto my tongue, WHAT THE HECK? I took a picture of it and sent it to my mom. Then I looked in the mirror and I could see the inside of my tooth. About 1/3 of my tooth had broken off. I think it was because I had a molar coming in next to it. The growing molar pushed the enamel off my tooth?!?! ?